It may have been the coldest weekend of the year in the UK so far, but the icy cold conditions on Saturday night didn’t prevent the fans turning out to support local hero Tasif Khan as he faced Mexican Champion and former WBC World Title Challenger Juan Lopez Martinez on the Bridie Murtagh (Saorise Promotions) promoted Dinner Event at the Royal Taj (formerly the Connaught Rooms) in Bradford. The importance of the fight clearly wasn’t lost on any of Khan’s fans, their man may already have secured World Boxing Union (WBU), Global Boxing Union (GBU) and World Boxing Confederation (WBC) World Championships over the past couple of years, but a victory on Saturday would mean that Khan, who is already highly ranked by the International Boxing Federation (IBF) in their Intercontinental Ratings, would be eligible to mount a challenge for the prestigious IBF Intercontinental Championship in the Summer as the first step to mounting a potential future challenge for the coveted IBF World Crown. Prior to the first fight of the night, Master of Ceremonies Sam Gorman gave a moving eulogy to British & Irish Boxing Authority (BIBA) Vice President (Scotland) Kenny Barr, who tragically passed away in December at the age of just 34, which was followed by a standing Ten Bell tribute. OK now let’s get onto the the main event, a ten round non-championship Super Flyweight contest between the aforementioned Tasif Khan and Juan Lopez Martinez. 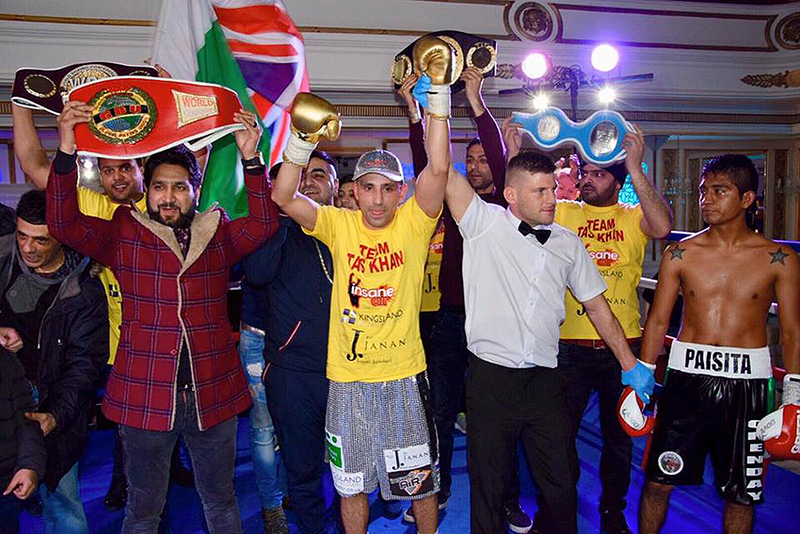 The atmosphere was electric as the protagonists made their way to the ring with the entourages in support waving their respective countries flags and in Khan’s case also carrying his many Championship belts. After the pre-fight razzmatazz and introductions it was down to business for the young Gladiators. Right from the opening bell both men began to cautiously vie for Centre-ring, Khan utilizing his superior reach to take effective control and force his more experienced opponent on to the back foot. About the midway point of the round Khan began to step up the pace, landing some big shots to both body and head, each time Martinez stood his ground and countered with good effect. In the second it was more or less the same, with Khan taking the initiative and actively attacking, whilst Martinez remained content to counter when the opportunity arose. 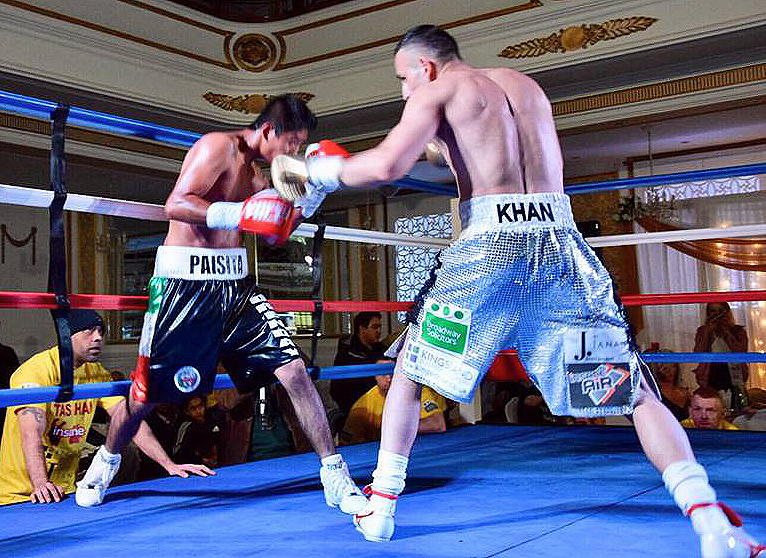 Round three see Khan step up the pace further, utilizing superior hand speed and slick movement to land a some sensational shots, the most notable was a huge right to the chin late on in the round. Martinez was clearly shaken, but still thinking clearly enough to change his tactics and tie the Bradford man up on the inside to prevent further big shots landing. Initially Martinez took the fight to Khan in the fourth, in doing so landed a sensational hook to the head of Khan. However this tactic just played into Khan’s hands and the Bradford man came back with some sensational combinations each time the Mexican mounted an attack. As the round progressed into the second minute, Khan caught Martinez with another big shot which sent the Mexican back towards the ropes, Khan stepped in and let rip with a double handed flurry culminating with a big left hook to the body, which sent Martinez to the canvas. Martinez made the count and made it to the end of the round by tying up Khan on the inside again. Round five see Martinez utilizing the tying up Khan on the inside tactic more, and at times looked outclassed. Khan’s superior ring-craft really came into play as the round entered the final minute, the confident persona Martinez carried in the early rounds was now gone, Martinez was beginning to try and slow Khan’s scintillating pace down to a crawl, constantly grabbing hold each time Khan mounted an attack, before letting rip with uppercuts at every opportunity, much to the dismay of Khan’s corner, who were shouting at their man to work off his jab and keep him at a distance. Round six see Khan confidently begin to wear Martinez down further with fast double handed flurries and powerful combinations to both body and head. At more or less the half way point of the round Khan broke loose from another attempted holding session from Martinez and fired a couple of stiff jabs, before stepping in with a huge hook to the body. 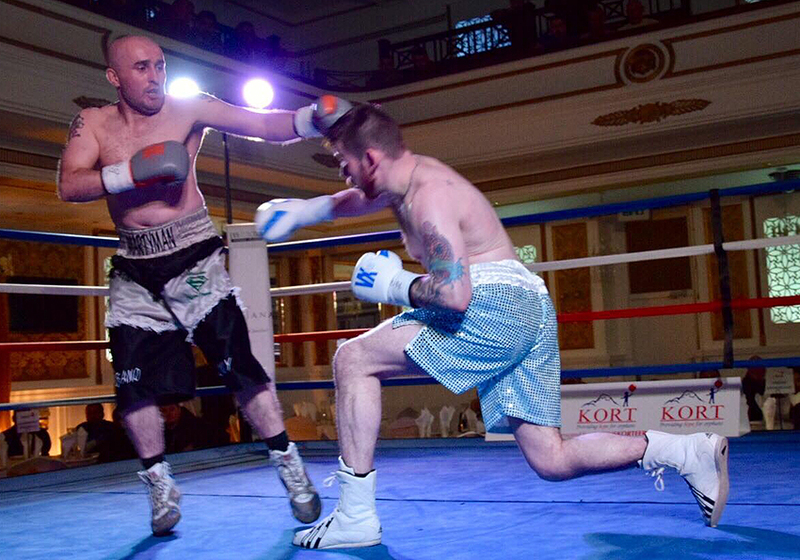 Martinez immediately collapsed to the canvas and was clearly distraught, however the tough Mexican tried his hardest to make it to his feet before referee James Ancliff’s count reached its conclusion, albeit unsuccessful in doing so. The official time for the stoppage 1 minute and 32 seconds of the sixth round. Preceding the Khan-Martinez headline bout was a six round Super Middleweight contest between Bardley, Lincolnshire’s unbeaten Nathan Decastro and very late replacement Malcolm Richardson from Blackpool. 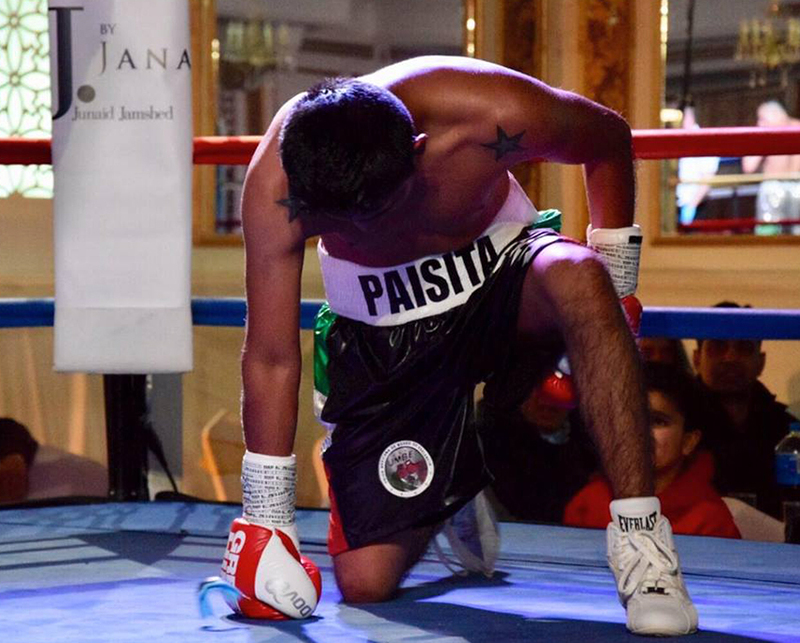 Originally IBF Ranked Decastro was due to compete against Ghanaian Philip Kotey, who had arrived in the UK but fell ill on Friday night. More disappointment for Decastro as a win over Kotey would have also positioned him for a potential shot at an IBF title later in the year. Right from the off it was clear that Decastro was intent on making a statement, the Bardley man closing of the ring and letting rip with power punch after power punch. Richardson’s made of stern stuff and stood his ground and countered with good effect. However as the round progressed towards the second minute, Decastro switched to the body, landing a massive body shot that sent Richardson down. Richardson made the count, in fact following the knockdown went on the front foot and landed a couple of good shots of his own, but Decastro’s relentless power shots got the better of the Blackpool man and with about 40 seconds of the round to go Decastro caught him with a huge body shot to send him to the canvas for the second time, this time though Richardson didn’t make it to his feet before referee James Ancliff’s count reached it’s conclusion. Official time of the stoppage was 2 Minutes and 30 seconds of the first round. 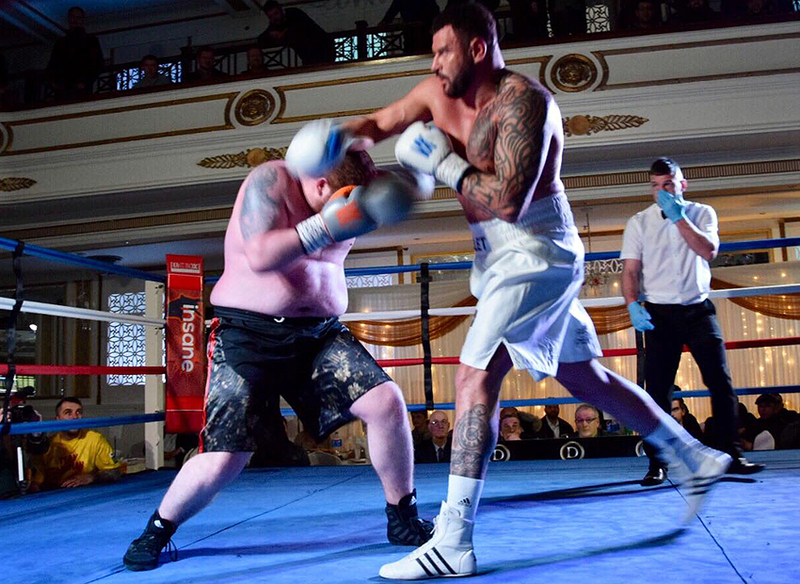 Prior to Decastro-Richardson it was time for a Heavyweight contest between Askam-in-Furness, Cumbria’s Lee Kellett and Belfast, Northern Ireland’s Ryan Kilpatrick. What a cracking fight, both lads gave there all for the full four rounds, much to the appreciation of those in attendance. After four highly entertaining all action rounds it was Lee Kellett that scoring referee James Ancliff decided was the victor by a 40-36 points margin. 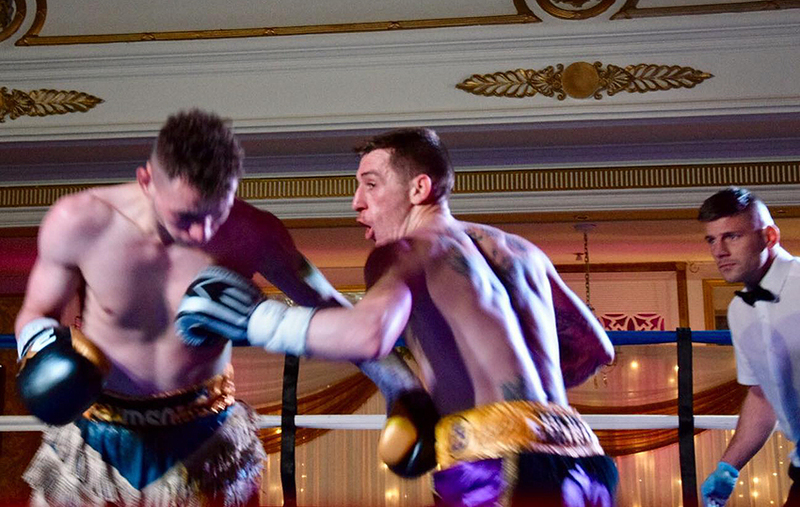 Next up was a four round Super Lightweight contest between Newcastle’s Jak Johnson and Liverpool’s Paul Peers. What a fight, it was a true Battle Royale, these two warriors gave no quarter, and it was a seriously top class battle. The first couple of rounds were exhausting to watch, pure toe-2-toe action from start to finish, so much so that this contest rightly earned the accolade of the Fight of the Night. The third though see Peers in the ascendancy, the Liverpool man steeping up the pace as well as switching his focus to the body of the Geordie with great effect, so much so that around the midway point Peers sent Johnson to the canvas with a pin-point perfect shot to the lower rib. Johnson made it to his feet but in the dying seconds of the round Peers found a way through Johnson’s excellent defence to land another shot to the lower rib to send Johnson down for a second time, this time Johnson couldn’t make it to his feet to beat referee James Ancliff’s count. Official time of the stoppage was 2 minutes and 59 seconds of the third round. The opening bout of the night sees Aberdeen’s Nathan Beattie in action against late replacement Belfast’s Marty Kayes. Beattie-Kayes was a purist’s dream fight, it was one seriously closely fought and highly technical contest, which wouldn’t come as any surprise to those in the know, as these two had fought each other previously. After four closely fought rounds scoring referee James Ancliff’s score card read 40-37 in favour of Nathan Beattie. There were due to be two further contests on the card - Obadai Sai vs Isaac Quartey and Patrick Okine vs Saidi Mundi, however these contests failed to take place due to only Quartey and Okine receiving their visa in time to make the trip to the UK.